We’d love your help. Let us know what’s wrong with this preview of The Old Creek Bridge by Sarah Kettles. When Jack Snyder was forced at age ten to deal with the tragic and explosive death of his moonshine-making grandaddy, he didn't. Instead, he became a self-made pariah, keeping only his monstrous temper for company. Now plagued by shame and a desperate desire to escape his small town, Jack lashes out at everyone. Everyone, that is, but his high school English teacher, his ma When Jack Snyder was forced at age ten to deal with the tragic and explosive death of his moonshine-making grandaddy, he didn't. Instead, he became a self-made pariah, keeping only his monstrous temper for company. Now plagued by shame and a desperate desire to escape his small town, Jack lashes out at everyone. Everyone, that is, but his high school English teacher, his mama, and the adorable Kelly Green. Through a combination of academic success and the support of these three women, Jack pushes aside his emotional volatility and—much to Kelly's chagrin—finds a way to escape: college. To ask other readers questions about The Old Creek Bridge, please sign up. In this book we meet Jack Snyder right after his granddaddy has been killed while running from the sheriff. Jack's grandfather is an ornery old moonshiner that people loved to gossip about. Jack discovers at the age of ten that there is a "monster" that he must fight with. His temper, he battles to control it and not let it become who he is. The story revolves around Jack and his family. His Dad who has melanoma that has spread, his northern bred mom, and his sister Mary. Jack hates his life in In this book we meet Jack Snyder right after his granddaddy has been killed while running from the sheriff. Jack's grandfather is an ornery old moonshiner that people loved to gossip about. The story revolves around Jack and his family. His Dad who has melanoma that has spread, his northern bred mom, and his sister Mary. Jack hates his life in the small southern town of Ajax. He sees college in his future and tries to keep telling himself that he can get out. He dates all through out high school the same girl, Kelly. Kelly doesn't want to leave Ajax. Everyone she knows and everything familiar is here. Why leave? She gets upset anytime Jack starts looking at colleges or mentions leaving. The author of this story is from the south and she actually does a rare thing. She brings living in a small southern town to life very, very well. That feeling that you can't leave? It happens. The fact that everyone in town knows your business. She also brings to life that feeling of solitude that can happen if you don't fit in with the people of your town, whether like Jack, you want for more out of life. Or like another character in this book, Louise (she was Jack's grandfather's common law wife) that you can just feel excluded and shunned. The book does meander on quite a bit though. I told my husband several times that I didn't feel like it was ever going to get to the point. He asked me "What happens? "..and nothing had. The story did have that feel of slow southerness about it though so I kept reading. It ended up being bittersweet in places and heartrendingly sad in others. Normally this is the spot that I highlight another reviewers review for the book I just finished. I'm the first person to review this one though. So I'm leaving it like this for now. Review originally posted at (YA)BookNook. Sometimes I have so many emotions crowding for my attention that it’s hard to get a review down. This is one of those times. Let’s try words again: THE OLD CREEK BRIDGE by Sarah Kettles is easily one of my favorite books of the year--all squeezed into one night of sleeplessness when I should have been studying. This book was everything. Everything. It follows Jack Snyder--rough, vulnerable, startling realistic--as he Review originally posted at (YA)BookNook. This book was everything. Everything. It follows Jack Snyder--rough, vulnerable, startling realistic--as he navigates the treacherous path of growing up and the secrets life has kept from him. I’d say the biggest secondary “character” of the book was Jack’s family. And, well, were they amazing. Let me just say this again: A YA boy with a present and involved family who are there for more than just soft padding. Am I swooning? Maybe. Jack’s family was Southern. I don’t know that there’s any better way to describe them, except that if you’ve ever lived in South US, you just... know. They were big and noisy and caring. Stifling when you don’t want them to be, but always there, just in case. The relationship between Jack and his mom was so beautiful and realistic, it almost took over the main romantic relationship. Jack and Kelly, though. I don’t wanna say too much because spoilery secrets, but suffice it to say it was impressive and heart-wrenching in all the right ways. It took me by surprise. Actually, that was one of many things Sarah Kettles did fantastically well: THE OLD CREEK BRIDGE is unexpected. It’s enticing and emotionally raw and dark. It goes places. It never shies away from consequences, never sacrifices truth for complacency. If I had to shelve it somewhere, I would put it between Maggie Stiefvater’s THE SCORPIO RACES and John Green’s THE FAULT IN OUR STARS. 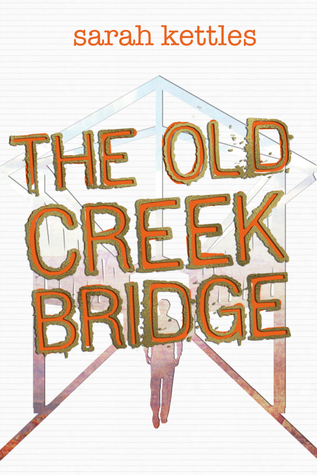 THE OLD CREEK BRIDGE is a completely different narrative, but it has the best parts of Literary wrapped in beautiful writing, compelling characters, and a vivid atmosphere. Also, the cover is so gorgeous I could kiss it. This book was interesting with a twist of creativity. It was about a boy that seems like the death of his grandfather really affected him and opened up a great family mystery! My favorite character is Mary because she is a great sister and relatable to my life. I enjoyed and emotions over this book, although the way people talked did make me keep thinking it was set in the past - do South Carolina people talk like that? The characters are well drawn and this book deals with a lot of things - teenage 'monsters' , pregnancy, cancer, and the one i found most hard to read (personal experience) child death. There were a few typos but for a self-published book that isnt too shabby as some full blown publishing house books have typos. Sarah Kettles is an American married to a Scot and living in Ireland, where she completed her MA in Creative Writing at University College Dublin in 2012. She’s been writing since she learned to read and playing with words since long before that. When she’s not working on her next book, she works as a freelance editor and illustrator. Online, you can find her at SarahKettles.com and @sfkettles on Sarah Kettles is an American married to a Scot and living in Ireland, where she completed her MA in Creative Writing at University College Dublin in 2012. She’s been writing since she learned to read and playing with words since long before that. When she’s not working on her next book, she works as a freelance editor and illustrator. Online, you can find her at SarahKettles.com and @sfkettles on Twitter.